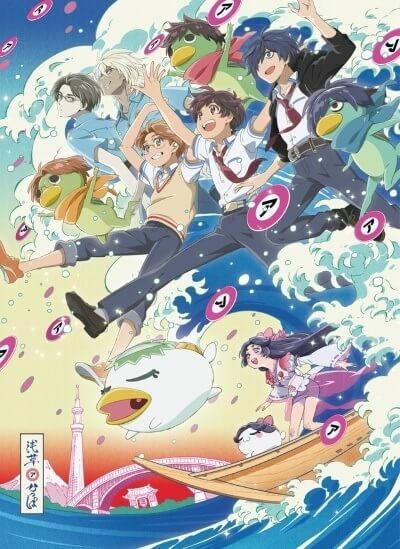 Kazuki Yasaka, an 8th grader living in Asakusa, is turned into a Kappa along with his classmates Toi and Enta by a mysterious creature named Keppi, after they break inadvertently a statue of a Kappa, the guardian god of the city. They are then ordered by Keppi, who claims to be the first heir to the throne of Kappa Kingdom, to fight against the Kapa-zombies, bioarms created by his enemies, if they want to return to their human form. In order to kill them, they have to make a specific sound called “Sarazanmai” which is produced only when the three of them are united, but the three boys cannot connect at first. In addition, one of their secrets is revealed to each other every time they emit the sound! They finally accept to take risks to collect the “Plates of Hope,” given by Keppi when they defeat the Kapa-zombies, and which can make their wishes come true. However, some trouble occurs over the plates…! Along the course of the fights against the Kapa-zombies, their fierce past and inner conflicts keep getting revealed. This is the sarcastic fantasy of three boys who don’t feel connected to their important ones, getting to realize the real meaning of bonds.